Are you a member of an industry association: ASHRAE Boston Chapter and has held Attendance Chair, Chapter Treasurer, Chapter Vice President, President-Elect and Chapter President in 2006-2007 & currently sits on Members Council, Region I Nominations Committee, serves on the Development Committee & the Asst. Regional Chair and Treasure For Region I as well as Board of Governors since 2001 and CTTC Chair, Research Promotion Chair, Chapter Programs Chair, Sustainability Committee, Honors and Awards Chair, Professional Development Chair, and Boston 100th Anniversary Gala in 2012. Awards: Star Award, Honorable Mention for Chapter Achievement, Special Citation, Recipient of the prestigious Golden Gavel Award, Chapter Service Award 2009-2010, Outstanding Member of the Year 2011-2012, Research Top Dog Award, Inducted into ASHRAE Boston Chapter Hall of Fame 2014, 100th Anniversary 2012 Gala planning committee. 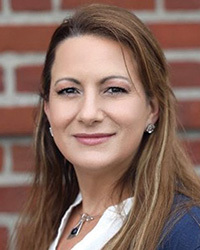 What does your firm do: Carbone & Associates is New England’s newest independent HVAC Manufacturer-Rep of LG products and 1st ever Woman owned. We offer a variety of HVAC solutions for any application. Any Plans for the future: I am in the process of opening a training center that will provide seminars of different skill levels for professionals in the building industry. Keys to success: ability to lead a team, determination, and customer care. Do you have a mentor: James Liston, PE. He was my department head at a former engineering firm in the beginning of my career. We have become close friends, he continues to mentor me and be one of my best moral supporters.